You’ve got the top of the line. GPX5000, GPX4800 or GPX4500! Are You Sure You Are Adjusting it Correctly? 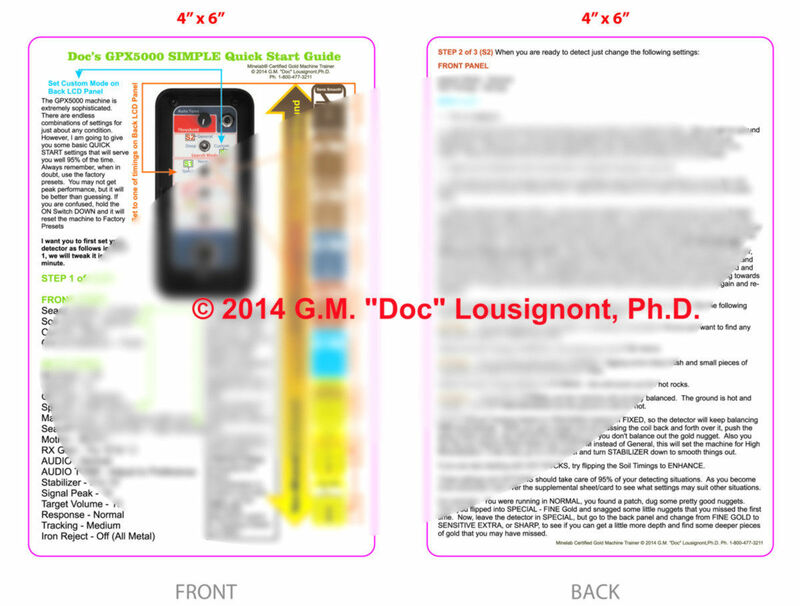 © copyright 2014, G.M. “Doc” Lousignont, Ph.D.
Get Doc’s Quick Start Guide Card and BE SURE! Doc, received your cards the other day, great job. 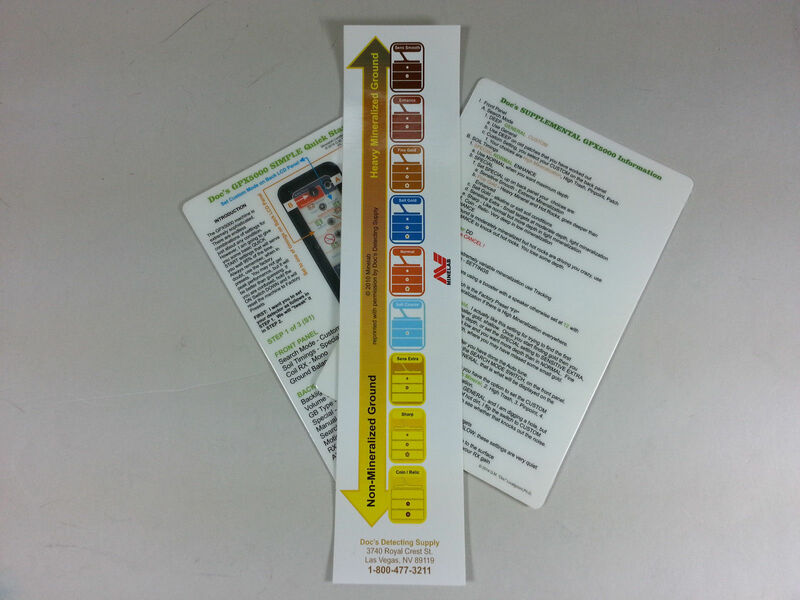 I usually carry a pocket full of flash cards with GPX 5000 info, they do not last long. Great durability and info. -Rick B.
I received my cards the other day. I think they will be extremely convenient for me. The number of settings and options on the 5000 are too many for me to remember and these cards will solve that problem. When I am learning a new detector I always carry the manual with me. 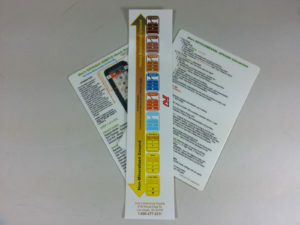 These cards will be much easier to carry and use in the field. 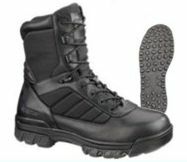 They will fit in my large shirt pocket or in my cargo pants pocket. -Fred M.
Don’t feel bad, over 90% of the owners of these fantastic machines are guessing about the settings, and are not sure they are getting peak performance. They’re not finding gold like Doc finds with his GPX5000. 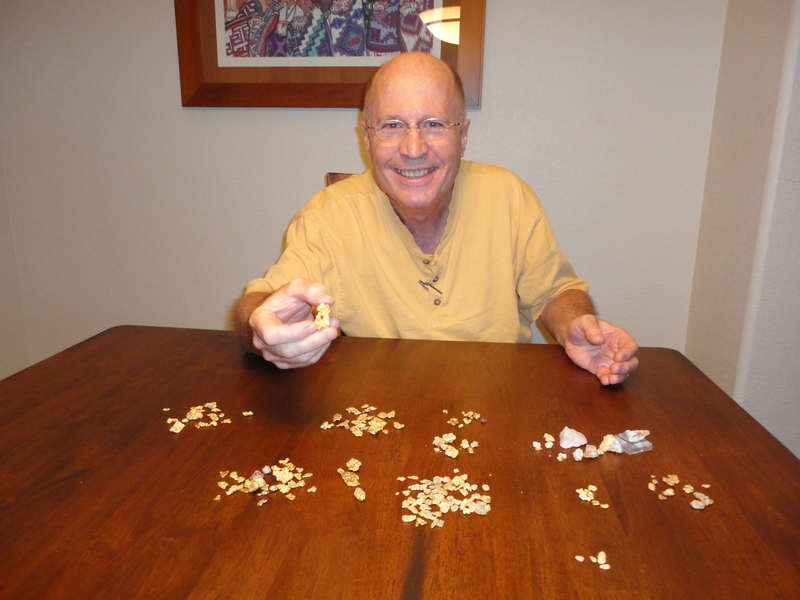 This is a picture of “some” of the actual gold nuggets found by Doc. If you’re not finding gold like this, WHY NOT? I’m finding little shallow gold, but I don’t seem to be getting any depth. Hot rocks are driving me crazy, I thought this machine was supposed to handle hot rocks. I can’t get this machine to quiet down, it drives me nuts. I’ve been using this machine for months. Why haven’t I found one piece of gold? The instruction manual is too big, I just need something to tell me how to set the machine. What coil should I use for optimum performance if I want to use the advance soil timings? The Minelab GPX series machines represent an amazing technological break through. However, there are literally tens of thousands of combinations of settings. 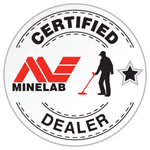 Learn the Secrets that will make you a proficient gold hunter with your Minelab Gold Machine. My QUICK START GUIDE will give you a fast and dirty way to set up your machine that will handle 95% of the situations you are detecting in. No more guessing at the settings. I’ll have you up and running in 3 minutes. You’ll know how to find small gold, bigger deep gold, handle hot rocks, handle hot ground, and quiet your machine down. • Professionally printed in the United States! • NOT some home printed and laminated card. 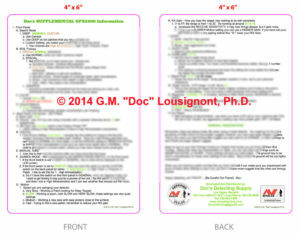 BUY NOW and GET Doc’s GPX5000 SUPPLEMENTAL Information Guide FREE: That’s 2 cards! 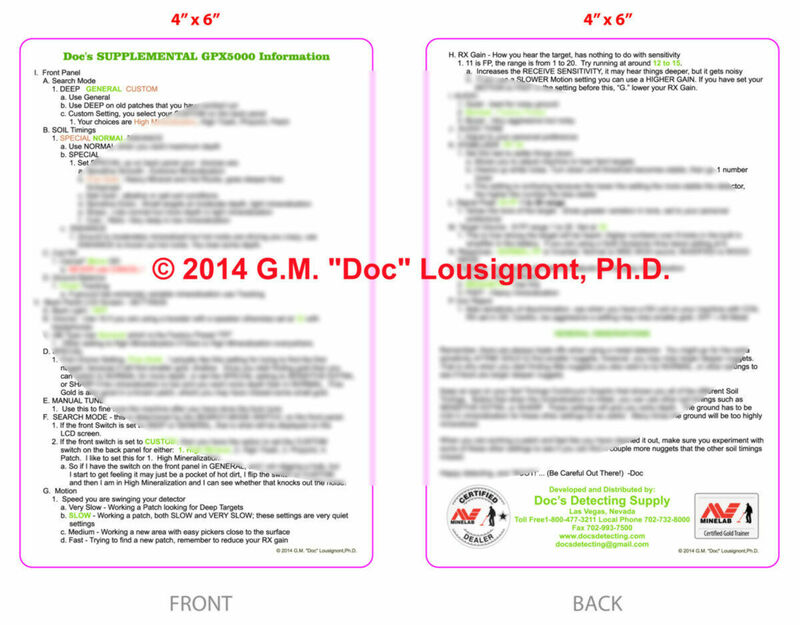 For a limited time I will include my Supplemental Information guide with advanced settings. The First Quick Start Guide will take care of 95% of detecting conditions. The Second Supplemental card will help you with some advanced settings for unusual ground conditions. use on your Minelab GPX5000 GPX4800 4500 for the best results.